cormac_chair, originally uploaded by lisabagg. I mean, is this the most beautiful baby you've ever seen or what? It's not just me, right? 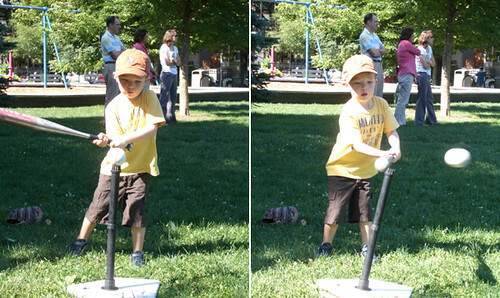 finn-slugger, originally uploaded by lisabagg. He got three hits at T-ball this week. imgp1793, originally uploaded by lisabagg. ... I can't even pretend I don't think Cormac is the cutest kid in the world. finn_bunny, originally uploaded by lisabagg. Here's a sign that Finn drew for our windows that shows that, despite having a dog*, not only are bunnies welcome in our yard, but we have lettuce and carrots for the asking. 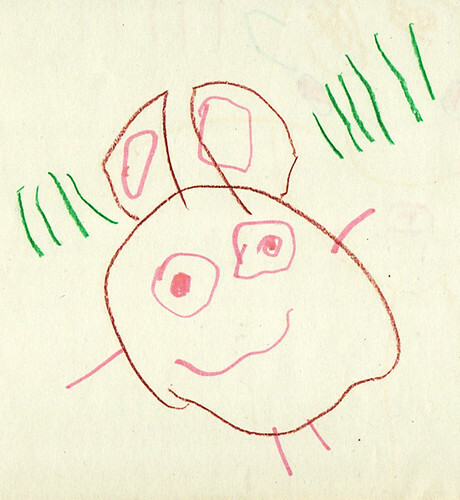 Those green lines are the bunny listening to something. * This is not a ruse invented by Santos, I hope. boom boom pow! from lisa hazen on Vimeo. Want to see three-year-olds get funky? Queue up this song. 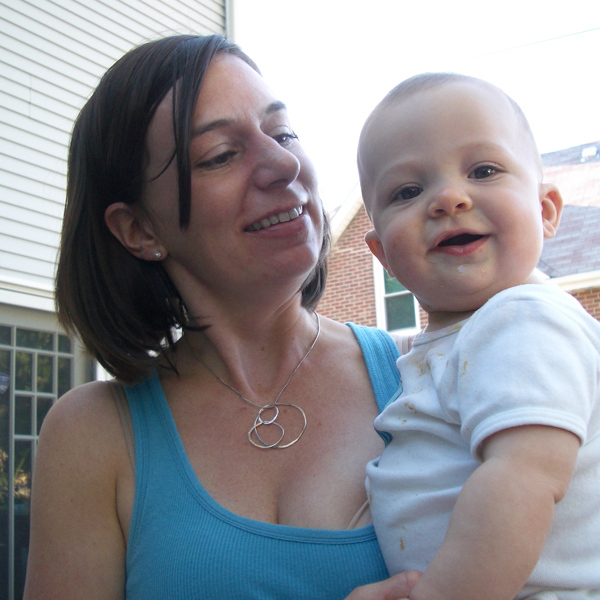 Cormac Crawls from lisa hazen on Vimeo. 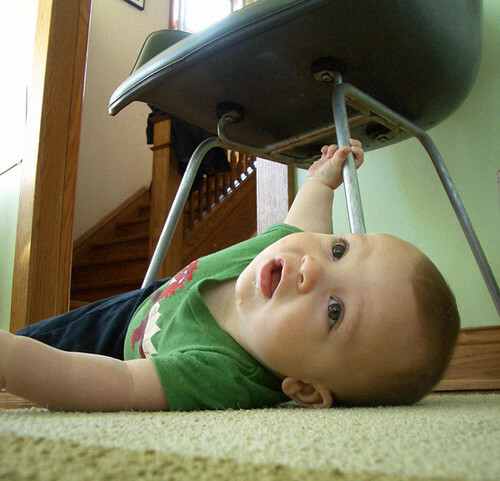 Crawling is hard work--just ask Cormac. He gives it a go here while the creepy baby from the diaper box peers on. finn_corm, originally uploaded by lisabagg. I have been so negligent in maintaining this blog, that I fear someday Cormac will say, "Why did you document Finn's every hiccup in his early months, yet only mention me periodically?" Let me assure you, future Cormac, it's nothing personal. You are the baby other babies aspire to be. Exposing you to other adults usually evokes a response like, "I want to have a baby just like Cormac!" even if they are men, 80 years old, or both. You should be a tiny baby ambassador. You are quick to smile, giggle at every joke, are never happier than when you're in a lap, and love-love-love to be around other people. (Especially kids.) You are deliciously chubby in your wrists, legs, and belly, and are without a doubt the cutest baby in the entire world. And I say this all totally objectively. More about you: You eat with absolute gusto (this is the only time we see you really get mad--if we're not feeing you fast enough). 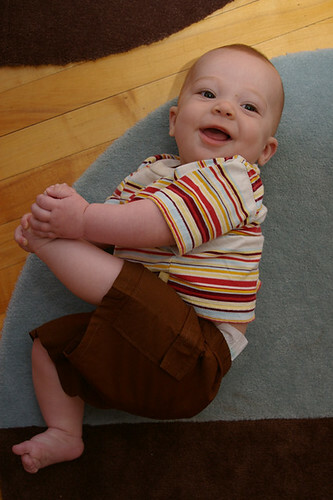 You are desperately trying to crawl, getting up on your hands and knees, rocking back and forth, scooting backwards. Then you kind of use your head as a default hand/foot and try to use it to inch your way forward, but it doesn't always work so well. You then usually collapse and look a little frustrated, until I look at you and laugh. Then, you good naturedly roll over on your back, look at me, and join in the joke. As if to say, "I know, I know! All in good time, right Mama?" You really can't wait to get into the mix with other kids. You see them running and playing outside, on bikes and playground sets, and kickkickkick and wonder why you can't get out there and play with them too. You love it when other kids play with you or give you your bottle. And you try to talk them, and really hold a conversation. I swear you really are telling them some long story--probably about footie pajamas or prunes or something. And without exception, kids totally love you--a little too much sometimes. Even our neighbor, Brookie, who said, "Cormac is soooooo cute! I just wish he was a girl." His favorite question these days is "WHY?" And I mean, the whole WHY thing is totally constant. "Mama, why do we have a chimney, but no fireplace? Why don't cats like dogs? Why can't kids drive cars? 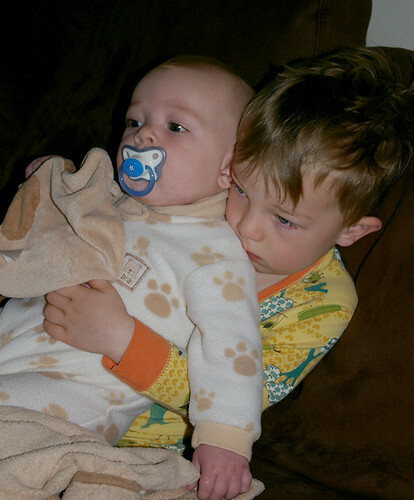 Why do kids have to go to bed earlier than grown-ups? Why is milk white?" FINN: "Mama, why do babies have feet if they can't walk?" ME: "Well, they're going to walk someday." FINN: "But then, why can't they just grow feet when they walk, like they grow teeth when they need them?" With this post, I vow much more documentation of these boys and their charming ages. Because I'd really hate to ever forget any minute.